Oh happy day! 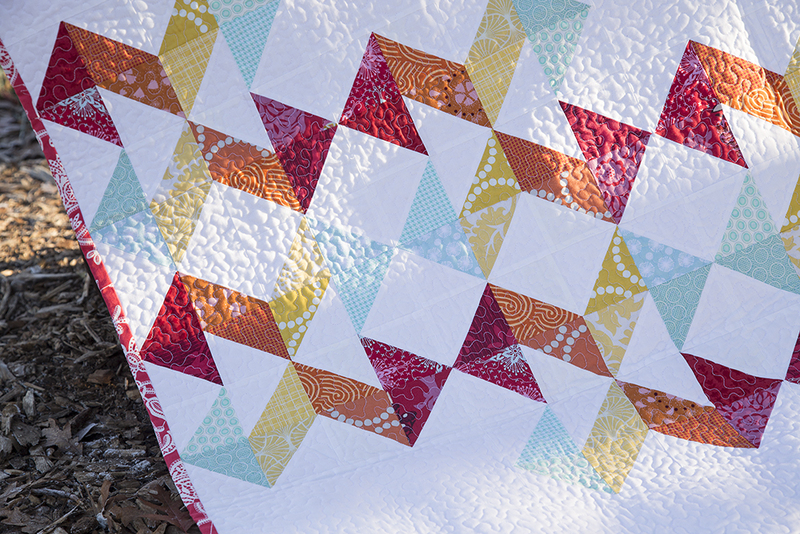 Today I get to finally share a quilt with you from Vintage Quilt Revival! Hopefully you stopped over at Lee and Katie's blogs this week to check out their first shares as well. Lee did a great job explaining the set up of the book too. This quilt is called the Geometric Slide. It's a great pattern for beginners and also uses a lot of negative space to showcase the design. I always thought it would be cool to see this with a bold focal print in place of the white, and have the neutral be the pieced areas. If someone ends up making one like that, I'd love to see it! It's so fun to now have the chance to show you these quilts that we designed two years ago. That's pretty hard to believe, it's a long time to keep things under wraps. Part of the book proposal process included having all the projects mocked up and writing sample chapters. (I'll be sharing my quilt from my sample chapter later on). I think this block also looks great with a scrappy background. I hope you enjoyed this first week of quilt sharing. Can't wait to share another project with you next Friday!